Do you suffer from migraines or anxiety? What about depression? Nervousness? Restleness? Insomnia? There's a beautifully fragrant herb that could help you treat the symptoms of all of these conditions naturally, and without any side-effects. Anxiety isn't easy to diagnose. It affects people differently. Some people can hide their anxiety symptoms so that you'd never guess they were affected, while for others, it affects everything they do. Pharmaceutical drugs that treat anxiety are highly addictive. When people become dependent on the active chemical in these drugs, they often develop other psychological problems. But now, there's a natural herb that can help wipe away your anxiety without any side-effects. It has a beautiful fragrance and lovely purple florets that can liven up any room. It's lavender of course! And, in a study published in Phytomedicine, a medical journal, it was shown to be just as effective as the pharmaceutical drug lorazepam for anxiety! 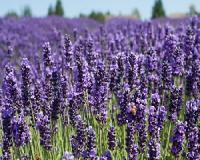 The first thing you should know is that lavender works best if you smell it. The brain activates its calming effects on the body through the olfactory system. The next thing you need to know is that, it can make you feel drowsy if you smell it in combination with your other anxiety medication. To help wipe away your feelings of anxiety, put a few drops on a hanky, or a fabric stress ball and smell the wonderfully soothing aroma. You can also put 6 drops in your bath water to sleep well. Some people make tea with the lavender florets and sip on it during the day. And, by the way, the florets are edible so you can add them to your salad too!